Silver Medalist Tieguanyin Wang tea (also known as Iron Goddess King) is now sold out! By popular vote, who is the real king? The word "Wang" means king. Higher grade Iron Goddess tea is called "Wang" because they are made of the highest quality leaves. Shen's tea garden highest grade is the Silver Medalist (King grade). The second best is Champagne Goddess (Jipin grade). Both teas won prizes in the November 2007 Tieguanyin Wang tea competition. There was mixed bag of responses. I was on holiday in the Far East when the tea was shipped. As you read every feedback on this page, you will find that it was almost a rollercoaster ride. When brewing tea, it is interesting to compare several at one go. But comparing different views of one tea can be equally riveting. The King grade has less aroma than the Jipin grade. Not that that can be the sole factor in judging a tea but I thought that it would have a much stronger aroma. Color of leaf is a nice green :-) for both the dry and wet leaves. It never ever gets bitter. What I do smell is something that the other Tieguanyin Wang tea do not have. Hard to describe exactly. It is also purer in a sense that there are less bad smells. A more elegant tea maybe. I have made a couple more bags: Used different amounts of leaves and temperatures for different infusions and brewing time, but still I cannot figure out what is the hidden secret about this tea. If there is a hidden secret, I surely would like to know what it is! For my money the King grade is better than Jipin, however, it has that problem of being very refined - maybe too refined for the average palate. Artisanally it's better constructed than the Jipin but its also more difficult to 'get,' and maybe not best of breed, which makes it expensive for what it is. I brewed the King grade side by side with the Jipin, and the King grade was subtler, lighter, rosier, had a better aftertaste, but was not nearly as pronounced on the palate. The mouthfeel was light as opposed to rich and thick, the aftertaste floral as opposed to buttery, and the liquor more like water as opposed to the vegetal green flavor carried by the Jipin. I think it's a matter of - pardon the expression - taste. I like my King grade and will happily drink it. Hope your vacation is treating you well. Feedback 2 - Danica from Los Angeles Again! Happy new year! I hope you are well. I brewed the Tieguanyin Wang tea King grade today 7 grams in a 4 ounce zhuni pot gongfu style and it was really excellent, perfumed and remarkable with a beautiful long aftertaste. I don't know if it was the tea in the particular packet, it's the first time I've tried it in the pot with such a large quantity. I'll try some again tomorrow and let you know what I think. It really has shaped up incredibly this time. I opened one and tried the tea by using my usual one scoop for loose tea, to one cup of water. I have one of those Karavina tea brewers, so I used the same settings I usually do for oolong loose tea. The first infusion was not very impressive...The color was very pale yellow, like dilute urine (sorry! ), aroma was like jasmine, and taste was bland to no taste. Do you think I brewed improperly? Maybe I am not so savvy on this tea to know this is how it is suppose to taste like a King grade of the Tieguanyin Wang tea. The tea leaves were dark green when dry and opened to good size leaf when hydrated. When opening the small packet there is a clear likeness to the Jipin grade in character, only the King grade has a deeper and richer fragrance including maybe a hint of mint? - plus a fresh shade of acidity and a sharper floral profile (if I may say so). Pouring water, I am rewarded also with a surprising similarity with the Dragon Well tea in the sense that there is a slightly "meaty" note, a soup-like quality - very pleasing, and possibly one of the signs of excellence in the Chinese definition of deliciousness in tea? (in pinot noir wines, "fleshy" is a positive characteristic, along with berries etc). This note is soon overtaken by a small explosion of fragrant greenery with a sharper edge of pleasant acidity than the Jipin grade. The second, and in particular the third, infusion reveal a discrete layer of subtle perfume (a sober and playful seductress!) over the variations of green succulence indoors and outdoors. The fourth infusion releases a trace of musk - or is it here that the iron makes its way though the foliage and flowers? A great experience! And a 5+ rating. This is my first tea tasting in 2008 and wow! What a great time I had! I feel so calm and energetic after the tasting session that I ran across to the other room and told my wife about it! I brew the Tieguanyin Wang tea - King and Jipin grade - side by side gaiwan style (using white porcelain). Tweaking brewing parameters to suit the tea is always a bad idea (any tea can be made to taste good if you are a good enough brewer) when you are comparing tea. 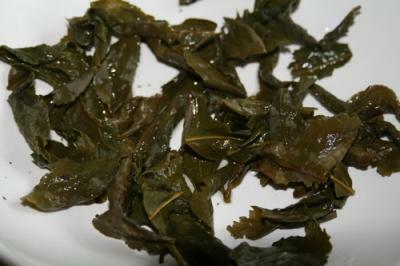 Dry leaves: Both Tieguanyin Wang tea are beautiful olive green with a lovely aroma. Jipin grade is more substantial and heavyset. King grade more emerald green. At first glance, it would seen Jipin grade is higher quality. Tea Liquor: Both are golden yellow, but the King grade is more greenish yellow, very much like urine - but with a pleasant golden green colour. A beauty to behold. Cup Aroma: King grade is more floral. For the first 2 infusions, Jipin grade came out sweeter, lighter and much more pleasant. King grade has a much more complex flavour. Being a Qing Xiang tea (less oxidised and greener than Jipin), it probably gets bitter more easily at boiling water. The revelation came at infusions 3+. The bitter taste vanished. What remains is pure delight. An aftertaste that is both penetrating and sticky. It tastes like an exotic fruit drink, like an iced lemonade on a hot day - so refreshing, cool and yet somehow electrifying and substantial. Still going strong at 4th infusion. This is a tea that will go all the way! So wonderfully fruity and there is something else that excites the top of the mouth! What is it? Is it what Stig called the Iron? Is it the renown Yin Yun (Iron Goddess Rhyme) at its best? I don't know. I was hooked. I was supposed to be testing tea, but I couldn't have enough of it! 5 feedback. 3 to King grade. 2 to Jipin grade. Verdict is the King grade is (well, just) the better of the two Tieguanyin Wang tea! Any comments? Let me know by filling up the form below! Comments for Tieguanyin Wang Tea - Who Is The Real King? Have something to say? Add them here! As for the tieguanyin wang, I tasted it again a couple of days ago, but happened to use too few leaves which resulted in a reasonably pleasant bouquet ("on the nose", as we wine-lovers say), but not much of a body underneath - and I earned the remark from my wife that she had to be ill before she would drink such a decoct (she is a coffee aficionada). This leads me to the question of how best to brew each tea - and to the observation that mood is very important for tasting. Might that explain the quite different views of the tieguanyin wang posted on your blog? Stig, for this tea, as I too found later, brewing is absolutely critical. When I wrote the blog, I brewed using gaiwan. The next day, I brewed in the office just using glasses (brew, drink, rather than brew, steep, decant) and the result is much poorer. It is much as Danica described her first and second tasting. The Jipin grade seems to make a much more consistent brew. That's why this tea is not out of line and will be the last I will sell untested. Still a great adventure to have! I think the Silver Medalist is a very fine tea, and somewhat finicky. It brews better in quantity gongfu style. I tried brewing lightly (3 g to 5 oz) a few times but wasn't as big a fan; the Jipin grade holds up better to a longer brew with fewer leaves. This may be an issue in terms of quality, and why I initially felt the jipin is best of breed for its price range. It may also contribute to why the king tea is a silver and not a gold medalist. However its complexity and bouquet are wonderful, and something lovely to experience. I have being tasting Tieguanyin tea for 2 week and I am trying to find a way on how to know if you are drinking realy good tea. Because if you buy to a Chinese tea shop they can cheat on you and sell you middle quality tea. So if someone can help me I would appreciate it. Thanks.